A clogged sewer line is one of the biggest headaches a homeowner can have - not only can you not use the water in your house, but there is likely to be big, smelly mess where the line backed up and overflowed. While there are DIY techniques for clearing minor clogs, serious drain problems are best left to a professional. Hair, grease, toys, mineral deposits, tree roots - there are innumerable things that can conspire to clog up a sewer line. If the clog is in the small drain line below a sink, shower or toilet, it can sometimes be cleared with a plunger, chemical drain cleaner, or handheld plumber's snake. If the clog occurs farther downstream in the main sewer line leading out of the house, heavy duty equipment is usually required to resolve it. 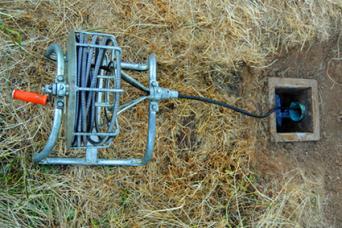 The first step in cleaning out a sewer line is to locate the clean out. This is a three or four inch diameter Y-shaped fitting with a cap on it installed somewhere in the sewer line. It may be located in the crawl space or basement, a utility closet or often, outdoors. The purpose of the clean out is to allow access for sewer cleaning equipment. The problem is that they can be very difficult to locate and in older homes, may be non-existent. The clean out is generally located near where the sewer line passes through the wall of the house (whether on the inside or outside of that wall), so the easiest way to spot it is by following the line to where it exits the foundation of the house. If you don't see it inside the foundation and it's not immediately visible outside, probe around in the soil in this vicinity with a pointed shovel and see if you can find it. Once you've found the clean out, the cap can be removed with a large pair of channel locks or a pipe wrench. If the cap is broken or rusted in place, consider it the first sign that you may be in over your head and call a plumber. There are several approaches to cleaning out a sewer line that vary in cost and complexity that homeowners can attempt themselves before calling a professional -- if there aren't signs up front that a professional is needed immediately. These vary from hand-cranked devices that cost less than $20 to enormous gas-powered machines that can only be operated by professionals. Sewer snakes consist of a long flexible cable with a claw and/or blades on the end that bust through the clogged material. 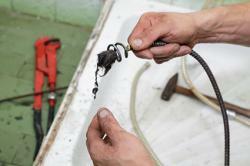 The snake is fed down the drain until the clog is reached and then rotated back and forth with the crank while pushing and pulling back and forth on the cable to dislodge the clogged material. The smaller ones make for a valiant first effort where the clog is located near a drain inside the home, but to clean the main sewer line, a larger, self-powered snake is needed. These are costly, but dedicated DIY enthusiast can rent them at tool rental centers. However, successful operation is largely a matter of practice and it's not uncommon to spend hours locating the clog amid the labyrinth of piping, much less to dislodge it. Using a self-propelled plumbing snakes can be a tiring, stinky, messy, and sometimes, dangerous job. Leather gloves are important to prevent chafing and burns from the cable as you guide it into the drain. It's also important to take care that loose pieces of clothing or hair don't get caught in the cable and pulled toward the drain by the powerful motor. Water jetting is a similar process to snaking, but it uses a powerful jet of water to dislodge the clogged material. 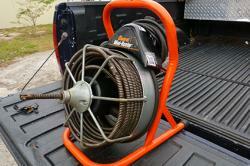 A hose is fed into the clean out with a device on the end that creates a very sharp, concentrated spray. There are smaller versions that can be powered with a regular garden hose while large truck-mounted water jets are often used for the most stubborn clogs. 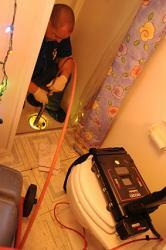 Most chemical drain cleaners are intended for small diameter drains on the inside of the house. If your clog is located in the sewer line, look for a drain cleaner labeled for use in the main line. There are also enzymatic and bacterial cleaners that dissolve build up on the interior of the pipe which are used as a preventative to keep your drain pipes from becoming clogged in the first place. One reason why professional drain cleaning services are more effective than homeowners trying to clean out their own drains is that they have access to drain cameras. Just like a snake or water jet hose, these are fed into the clean out and allow the operator to see exactly what is going on in the drain. This way they can determine the best possible approach, rather than working blindly. A camera can also be used to find the clean out when its location in unknown. In this case, the camera will be fed into one of the house drains until the operator spots the Y-shaped juncture that represents the clean out. They then use a remote sensing device that allows them to hone in on the exact location of the clean out in the house or outside. The same technique is also useful for determining the precise location of a clog that can't be unblocked, which can easily occur if tree roots penetrate the drain line. 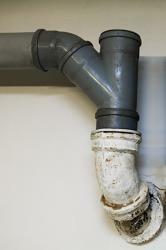 This means that the exact portion of the clogged pipe can be dug up and replaced, rather than replacing the whole line. Cleaning out a sewer line is rarely a simple plumbing repair. At any step of the way, if you find the process more complicated than you feel comfortable with, make a noble retreat and call a plumber who specializes in cleaning out sewer lines.